This lovely, happy Florida brood knows how important exercise is for good health. Joanne Johnson. How can I get my greyhound to lose weight? When I adopted my 5 year old. 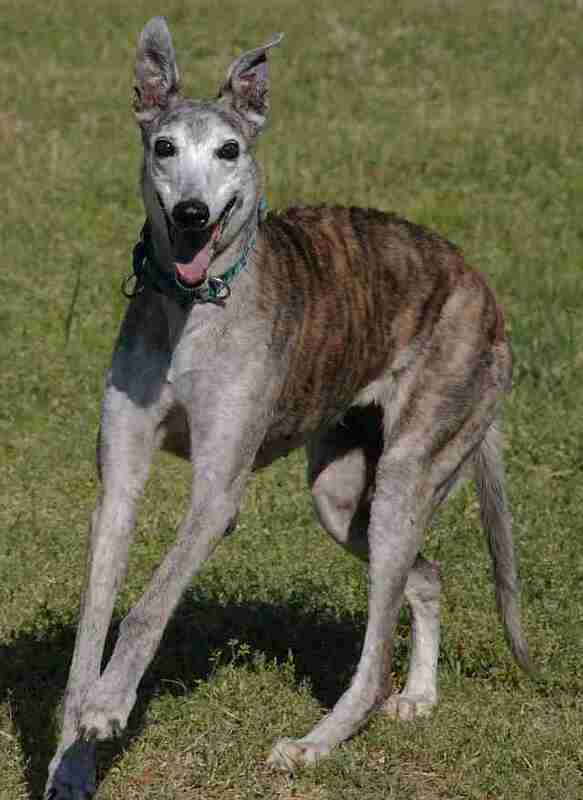 female spayed greyhound three years ago, her racing weight was 55 pounds. Three months later (after being spayed one month earlier) she was up to 70 pounds. Soon after that she went up to 92 pounds. Help! I have tried everything to keep her weight down. She is eating two cups a day of Nutro brand Optichoice food (14% protein 8% fat). She does not usually eat it all. She has been stealing the cat food so now we feed the cat in the crate to keep her away from it. She doesn’t get much table food but begs all the time. We tried getting her to run or go for walks but it’s hard to drag a 92 pound dog around the block. We got her a stepsister greyhound to play with her and she ignores her. Would Prozac help? We’ve even thought of sending her to a kennel to loose weight. L Rozycki. An overweight Greyhound is a sorry sight and I sympathize with you. As the chagrined upright companion of an overweight mixed breed (and normal weight Greyhound), I know how difficult it can be to get the extra pounds off. There are several things to consider and to try. First, rule out the possibility that your plump friend suffers from a physiologic problem that is making weight loss difficult. A thorough physical exam and routine bloodwork, including thyroid levels would be a good place to start. Treat any conditions discovered. Second, we all lose weight more readily when the daily routine burns more calories than we take in. There are several good quality, low-calorie diets available for dogs. These diets generally have higher levels of soluble and insoluble fiber than maintenance dog foods, in an effort to increase the volume the dog can consume while keeping calories (especially fat calories) quite low. Increased fiber also increases the efficiency of the gut. Some of these diets, such as the CNM O/M diet, allow your veterinarian to calculate the exact volume the dog should consume daily, based on the difference between ideal and actual weight. Many of these diets have biscuits that can also be calculated into the daily ration. Your veterinarian could give you more information on this and similar diets that they are familiar with. We have had very good success getting large amounts of weight of some of our patients with this approach. Some dogs also respond very well to home-cooked food. This can be somewhat labor intensive, and it is very important to follow a recipe that is nutritionally balanced, while low in fat calories. Some excellent recipes are available in books by Dr. Pitcairn or through your veterinarian. However, any program is only as successful as the level of commitment of everyone in the household. If weight loss efforts continue to be unsuccessful, it is important to reexamine the interaction of the household with the dog. I discovered that my plumpet was going to work with dad and conning biscuits from visiting salesmen. No wonder no weight came off. Table food has to be considered off limits except for fresh fruits and vegetables. Treats should be a calculated part of the program. Finallly, regular consistent exercise is a must. I know that this is not an easy answer but I am strongly opposed to the use of various drug therapies for weight modification without proof of physiologic disease. Prozac, a tri-cyclic antidepressant, has been used in dogs to treat some anxiety-related behavior disorders. While loss of appetite is a described side-effect in humans, this generally occurs at high doses given over a long period, and can accompany other side effects, such as hypertension, elevated heart rate, nausea and vomiting. It can take up the three months to show clinical effect.